Its attractive design and assembly is made to match your furniture and home's interior. It is aesthetically designed to blend in. Functionality-wise, the durable steel shaft and top-grade plastic components are manufactured to provide a secure hold on devices and furniture without damage to its surface due to the clamp and holder's protective high-quality paint coat. With the clamp's twist-and-turn knob, it's convenient to securely set the holder onto desks without the use of hardware tools. 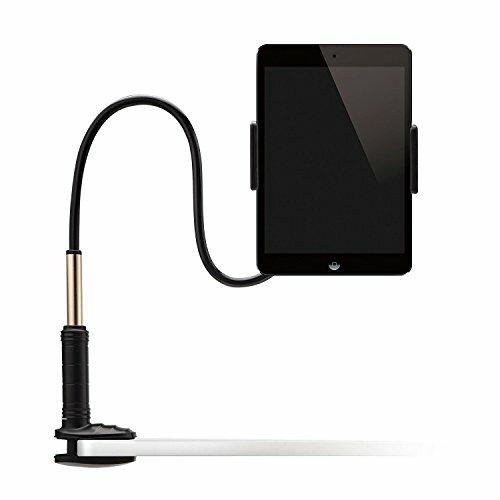 The Cell Phone and Tablets holder is 360-degree rotatable and the arms are adjustable to the right level and position for a better viewing angle. Set in on a bedside table or the office table and this makes a functional electronic device holder for both your free time entertainment and work-related tasks. You can use it in the kitchen as a recipe stand. You can use it as a Nintendo Switch mount when lying in bed with the controllers in hands. You can attach it to your nightstand to watch the Netflix. Actually you can attach it to any surface thinner than 3in. - Holder Length: 9"-10.75" Holder Width: 6"-8"
If you have any questions about this product by Foraco, contact us by completing and submitting the form below. If you are looking for a specif part number, please include it with your message.